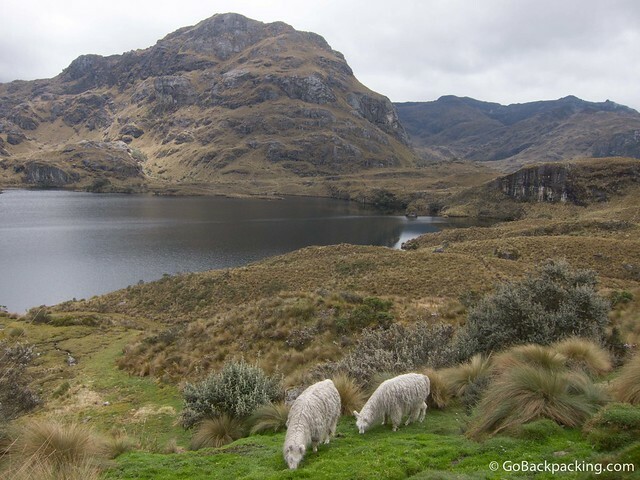 I first drove through Parque Nacional Cajas (or El Cajas National Park) on the bus from Guayaquil to Cuenca, however because it was in the early evening, I couldn't see a thing. All I could tell, judging from the sharply colder air coming through my window, and the altimeter on my watch, was that we were driving over a mountain pass 4,100 meters high. 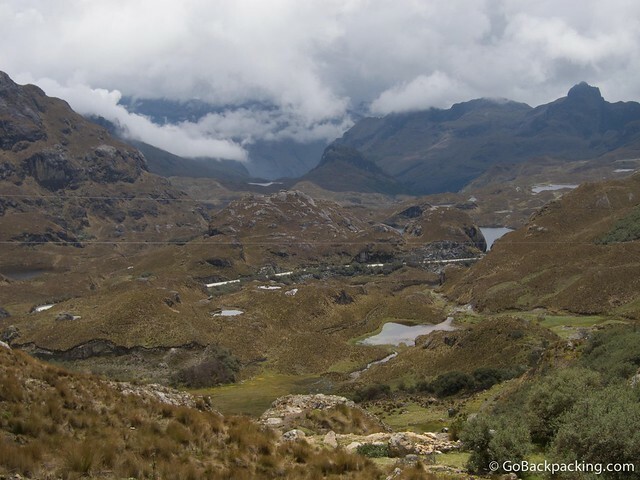 Once I'd settled into Cuenca (elev: 2,500 meters), I booked a day trip to go hiking in El Cajas National Park. I was joined by an older, German couple. 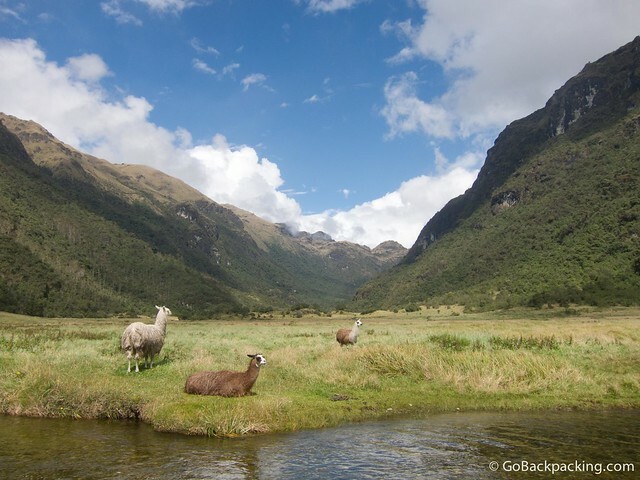 Our day began with a walk through a beautiful, glacial valley (elev: 3,100 meters). This part of the park is cloud forest, and home to a wide array of birds, however because it was a sunny day, there were few birds to be seen. According to our guide, the native birds are more active when it's cloudy. As pretty as the valley was, it wasn't unlike other glacial valleys I'd seen. It did, however, help serve to get us acclimatizing. 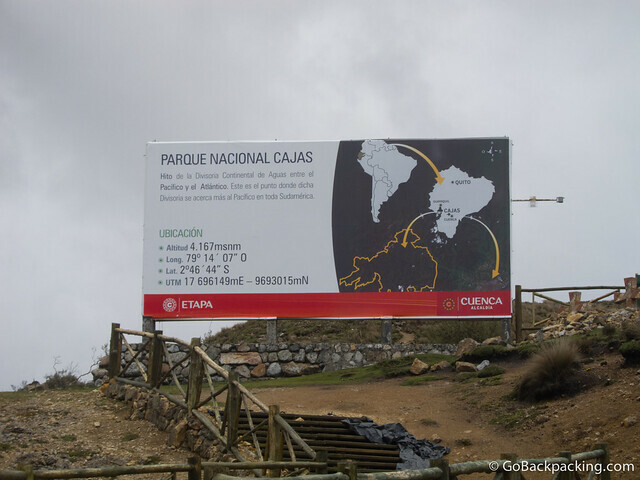 We drove along the same highway my bus from Guayaquil had taken, until we were at the pass, which was marked by a giant park sign (elev: 4,167 meters). Our guide pointed across the highway at a mountain, and said it was exactly along the Continental Divide. The Continental Divide indicates to which ocean the rivers in the region will flow. Rivers on the Western side flow to the Pacific, while those on the Eastern side flow toward the Atlantic. It seems hard to believe small rivers would flow from Southern Ecuador all the way to the Atlantic, but they go the long way, down and out through Brazil and the Amazon. At the lodge near the entrance of the hiking trails, I ran into Sebastian, my bunkmate from the Galapagos cruise. We'd exchanged Facebook info, however we hadn't been talking, so it was completely random to run into him there. He, along with some friends, were hiking the park independently, which is a an easy way to save some money. 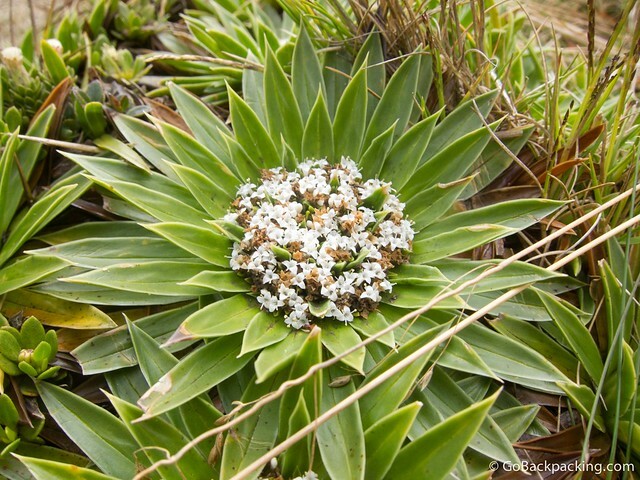 As my group walked ever so slowly, hearts pounding, our guide pointed out different types of flora. I'm always fascinated by the little flowers that manage to grow at such high altitudes. The park is home to a wide range of animals as well, including pumas and wolves (we saw some fresh tracks). 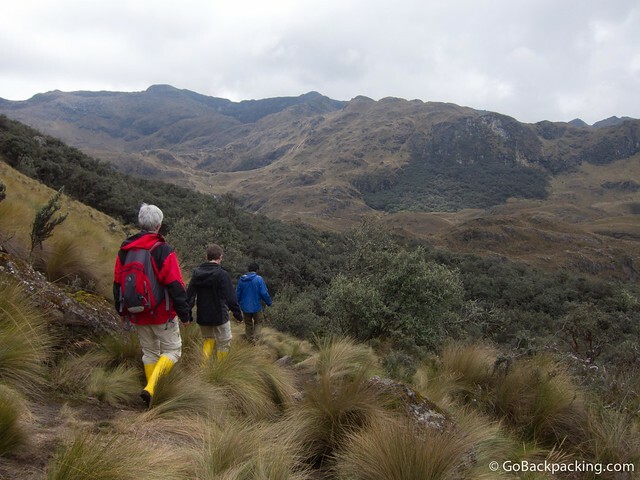 Forests are rare at elevations as high as 4,000 meters, however El Cajas National Park is home to quinua forests, which as also known as “paper tree” forests on account of the type of tree that grows there. The bark is literally paper thin. It's so thin, in fact, that it can be peeled off and used to roll tobacco, for example. 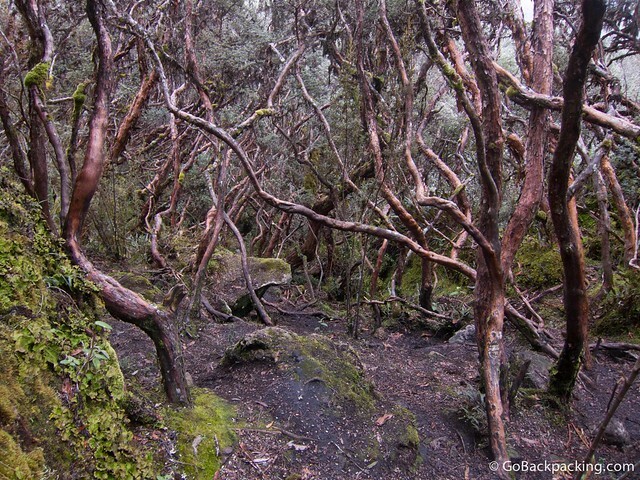 The twisting paper trees, and moss-covered rocks gave it a fairytale-like feeling. It was certainly unlike any other forest I'd ever walked through. I imagine in Winter, when it's coated with fresh, white snow, it's even more amazing. Hearts still pounding, we made our way back to the car, and drove a short ways for a late lunch at a nice mountain lodge. It was here that I discovered one of my favorite Ecuadorian dishes — Locro de Papa. It's a creamy potato soup with a slice of avocado thrown in, and optionally, a chunk of cheese too. The main course was fried trucha (trout). I spent two days hiking and camping here alone. For two days I heard nothing but the wind, the sound of my footsteps, the flow of the rivers, my breathing and the occasional bird chirping…paradise. Amazing place to visit and hike if one is in the Cuenca area. High quality pictures with a very good content. I must say that I like it very much. Never forg…….. 20 years ago I have a beautiful experience in this place is magic I can’t understand or discover what happen !! is a dream, have secrets the lake. I meet friends Matthew and Steve both lived in Utha I miss u guys I wish back soon ….